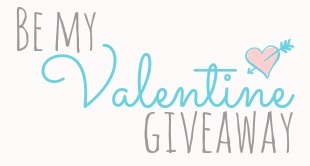 I love books and I LOVE romance books, so I thought -- why not give away a favorite romance book of mine for Valentine's Day? So I am doing just that! I posted earlier this week [My Top Ten Romances] that range from adult historical romance to young adult contemporary fiction, so as you can see my romance tastes vary quite a bit. I will be giving away one book from that list to one lucky winner [open international - just make sure the book depository ships to you!]. Enter below for a chance to win & good luck! Totally agree with Amy & Rogers Epic Detour, such a sweet book!! I am keen to read Raw Blue and My Life Next Door personally! Since I already am head over heals in love with Jill Shalvis' books and heard so many good things about Sloppy First I would pick that. Thanks for this awesome giveaway. I'd like to win Such a Rush! Thanks for the giveaway and Happy Valentine's Day! Happy Valentine's Day! I'd love to win Raw Blue. I have heard such good things about it. Thanks for the great giveaway! I've been dying to read "My life next door", so it would probably be my choice even though the other books seem equally amazing! Happy Valentine's Day! I'd love to win Sloppy Firsts! Ooh I'd love to win My Life Next Door. Happy Valentine's Day! Happy Valentine's Day! I would love to win My Life Next Door! Happy Hearts Day! I've heard good things about My Life Next Door by Huntley Fitzpatrick so I would ((love)) to win it! I would choose My Life Next Door. Thanks for a great giveaway. Just one!? I think I'd choose Head Over Heels. I would pick Raw Blue. Thanks and Happy Valentine's Day! What a great list! Sloppy Firsts has been on my TBR list for a while, as has Raw Blue. Sloppy firsts, loved the summer I turned pretty series. I want to win Such a Rush! Thanks for the giveaway. I would love to win My Life Next Door but all are great choices! Thanks! 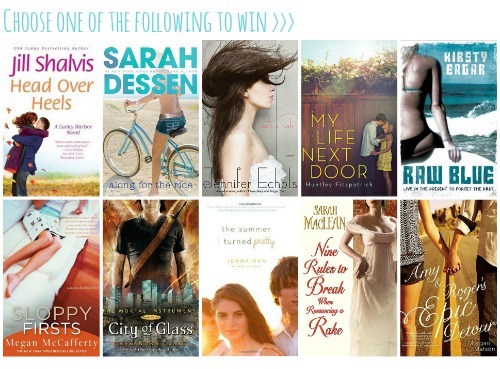 I would love to win "Head Over Heels" by Jill Shalvis. I love her books. I would probably like to win Raw Blue by Kirsty Eager. I keep seeing Sarah MacLean's books popping up, and I do enjoy historical romances. I'd love to read Nine Rules to Break When Romancing a Rake. Happy Valentine's Day and thanks for the giveaway! I'd love to have Such A Rush! I still haven't read My Life Next Door. I'd like that one. I'd like to read Raw Blue. I'd love Along for the Ride. I'm really wanting to give Dessen another go and since you suggested this one because it's your favourite, it makes sense that I start there! HEAD OVER HEELS looks fabulous thank you. I'm going to have to go for Head Over Heels, because, we both have such awesome taste that I own these. hahaha. ASHAMED OF MY BOOKSHELVES BECAUSE THEY ARE OVERFLOWING. I think I'd pick "Nine rules to break..." :) Thanks for the giveaway! I think i'd want Raw Blue. I've been wanting to read that for awhile. Amy & Rodger's Epic Detour, please! I would love My Life Next Door. I've been wanting to read it, and it's one I think my students would love. Plus, the cover is GORGEOUS! I'd like to win My Life Next Door. It sounds fabulous! You chose so many good titles in this list! My Life Next Door, Amy & Roger's Epic Detour, Such a Rush, City of Glass... these are some of my favourites too! One book that I am intrigued about is Raw Blue. I've heard many good things about this book, but I haven't been able to get my hands on it yet! I've always wanted to read Megan's series, because I hear it's amazing! I'd love to win Sloppy Firsts. :) Thanks for the giveaway! I love your list. Some of my favorites are on there too. I would probably pick City of Glass, or Raw Blue, or My Life Next Door. I'l pick Along for the Ride because it's one of the few Sarah Dessen books which I haven't gotten around to reading yet. Well . . .I have all of them except for 2, lol. But I would like to read Head Over Heels by Jill Shavis. You've shared and praised so many of her books - that I feel like I must read at least one of them. And I will whether I'm the winner or not. Thanks for being so generous with this giveaway and always sharing some really amazing books. I'd love to win Sloppy Firsts- I've heard such great things about the book from so many bloggers! I would like City of Glass, if I am lucky enough to win! I would love to win Such a Rush by Jennifer Echols. I'd love to win My Life Next Door, since I've heard so many wonderful things about it! I would love to win Raw Blue!!! I've heard such good things! Thanks for this awesome giveaway!!! I've been meaning to read My Life Next Door for a while now! Thanks for the awesome giveaway!